To bake the cake: preheat oven to 350 degrees F. Butter and flour 2 (9-inch) round cake pans, or spray with nonstick-flour added cooking spray. In a medium sized mixing bowl, sift together cake flour, cocoa powder, baking powder, baking soda and salt; whisk until combined. In a small mixing bowl, whisk together buttermilk, oil, food coloring and vanilla until combined. In a large mixing bowl, using a mixer on medium speed, beat together butter and sugar until light and creamy, about 2 minutes. Beat in eggs - about 2 minutes - until well combined. Gradually beat in flour mixture, alternating with buttermilk mixture (scraping down sides of bowl occasionally), until combined; continue to beat an additional 2 minutes or until ingredients are well incorporated and batter is smooth. Divide batter into prepared cake pans. Bake at 350 degrees F, for 35-40 minutes, or until center of cake springs back when lightly touched, and outer edges pull away from pan. Cool pans on a wire rack for 10 minutes; run a knife around outside edges and invert cakes onto wire racks to cool completely. To make the frosting: whisk together sugar, milk and flour in a medium sized saucepan; bring to a boil over medium heat, whisking frequently. Continue to boil for 1-2 minutes, whisking constantly, until thickened; cool in the refrigerator or freezer until completely chilled. In a large mixing bowl, using a mixer on medium speed, beat together butter and cream cheese until creamy, about 1-2 minutes. Beat in chilled milk mixture and vanilla, until well combined and fluffy, about 2-3 minutes. To assemble the cake: spread frosting evenly over layers, sides and top of cake. 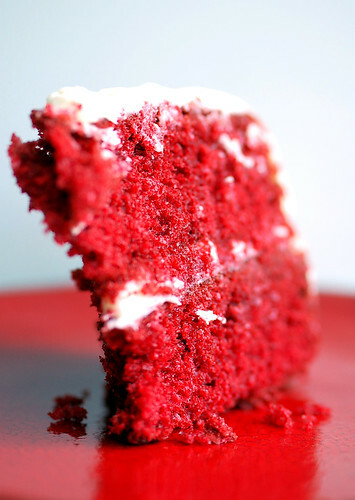 43 comments on "Red Velvet Cake"
Happy Belated Birthday to you and Emily! I enjoyed your posts on the trip to France. Sorry it wasn't a better trip. Well that's a nice bday surprise! I have never had red velvet cake...crazy right? i love this post! you are so fun. those walmart tshirts are hilarious! i recently went to a white trash bash and i knew exactly where to get my attire: alllll at walmart for under $10. i got a miley cyrus shirt that has big lips on it and it says "kiss my lipstick." naturally, i cut it to bare my midriff and wore a lime green bandana and obnoxiously short shorts...it was hot. i LOVE the way he sprinkled the cake. what a fancy technique. He's too sweet. Do you know that in 12 years together and almost 9 years of marriage, SPP has never cooked for me? That's what happens when you spoil a man too much by cooking for him all of the time. Keep making him cook for you, Emily! Otherwise you'll spend your life in the kitchen! That is one RED cake. I want some of that frosting. Looks like a beautiful birthday party anda beautiful 4th. You are so deserving of a good day! I'm making a red velvet cake in a few weeks, I'm gonna try out your recipe and see what happens. Thanks for sharing! LOL. AHAHAHAHAHA YER TOO FUNNY! This blog made my day. Happy late birthday (please tell that to your sister, too). Anyways, I'm glad you had a great time and thanks for updating! It's always interesting to hear what's going on. First of all, DON'T SAY you're not going to win. 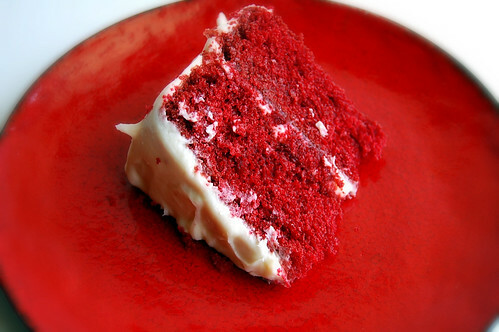 Secondly, what a luscious looking cake and I've never really seen the point of a red velvet cake. Either have one that's chocolate with LOTS of cocoa powder or DON'T. BUT yours sounds fantastic and the icing is worth the price of admission alone. That is soooo sweet of Eric and so smart of you to start the birthday cake baking tradition. No cake is ever better than the one that someone makes just for you. 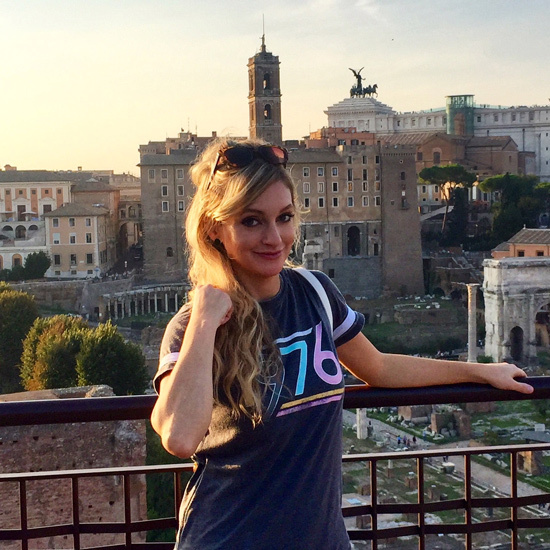 Just found your blog today via Tastespotting and think it's so cute. 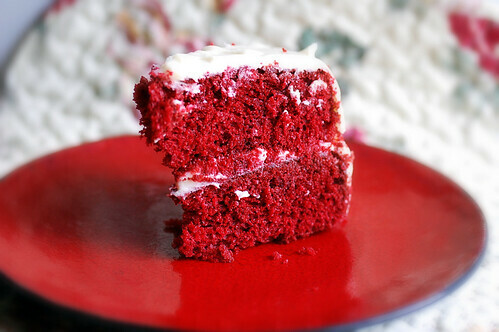 Love this red velvet cake, I'll be making it soon; thanks for the recipe! First of all, good luck in Iowa!!! Second of all, I LOVE red velvet cake! I actually have a friend who cannot eat it because she has kidney problems and she is not allowed to eat anything with large quantities of red food coloring which is super sad to me. Those chocolate covered pretzel sticks look pretty darn good too. Glad you had a good birthday/ 4th of July!!! PS I have your red cake pan but mine is white and I love it- it's so much easier to clean then the glass ones!! Looks like you had a wonderful birthday and how sweet that Eric made you a Funfetti cake!! Very good job! Love the red velve cake too! Aww that's such a sweet thing for Eric to do. Happy belated birthday, Emily!! your cake looks totally yummmmy! i clicked on the link from tastespotting i want someone to make me a funfetti cake too! cute story. Thank goodness we don't live in the same zip code, because I think we would be BFFEs. I love KFC (shh), I love cake, I love whole bottles of red food dye, I kind of like to bike, and I freakin love Wal Mart. And Eric's sprinkle technique is awesome! I think guys have some sort of secret sprinkle instinct. My boyfriend wakes up in the middle of the night and makes sprinkle and jelly sandwiches. Weirdo! i will definitely have to try your red velvet cake! it looks undeniably good! and i like how your bf took sprinkling on to another level. haha! Happy belated bday! Funfetti is my favorite too :) Your red velvet cakes looks amazing too! you are just SO cute!!! and funny too, i love that in a human!! Love the cake, looks like you had a fabulous b-day! Yahoo! Can I have a slice? Looks very good. Love this post! I laughed so hard - I need a laugh, my weekend was terrible. You got some great birthday presents - hmm, not so sure about the foot though. I love your posts!! They always make me smile!!! Loved your post. The shirts rock! Loved the recipe for the red velvet cake too...a whole bottle? I just made this recipe in cupcake form. It was absolutely delicious! Christina, that's so funny. I bet you had the best costume at the party. Rachel, he does make a mean buffalo chicken pizza. Maybe he'll make one for me someday? Sue, I completely agree. I'd rather have chocolate cake! Natalie, I think we'd be BFF's too! Thank you, Today's Lady! I'm actually watching Real Housewives right now! Whoooo. Ummm red velvet cake, stationary bikes, and fried chicken?? We could d e f i n i t e l y be best friends, teehee! 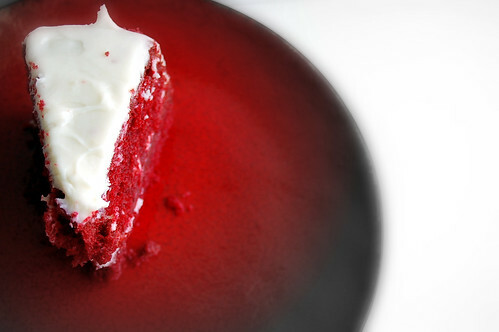 That red velvet cake looks freakin' amazing!!! And I have been craving KFC for ages. This post is making my tummy growl!! i am so glad you follow you on twitter, even if i don't ever really use it :) i love red velvet cake, and even though i have to eat gluten free.... i am going to try my hand at making one from scratch, inspired by you! glad you had an awesome bday!! :) that cake looks to die for, too! TMI but seriously what is going on 10 months before July 4th that makes people in the mood for lovin'? I swear I know like 6 people now born on the 4th of July! i love your bike by the way, with a bow on it - how adorable! And now I'm STARVING! That cake looks just amazing! Oh man! I made my sister's wedding cake from scratch, and it was red velvet with cream cheese frosting!! That was a fun read. Eric's cake is great, KFC not so much. I so want to nom on a piece of that cake right now! My AND my husband's birthday is on the 4th of July also. It's pretty much the best day EVAR to have a birthday. All the cool kids are doing it. You seriously crack me up!! Happy belated birthday! Maybe you and Eric should open up a bakery together. Looks like he has some baking skills, too. I'm suddenly craving KFC. It's like I can almost smell it. Seriously. Deep fried yum. I just finished baking you red velvet cake. I just tasted a little crumb that fell off the side while I was frosting and it was simply amazing!! 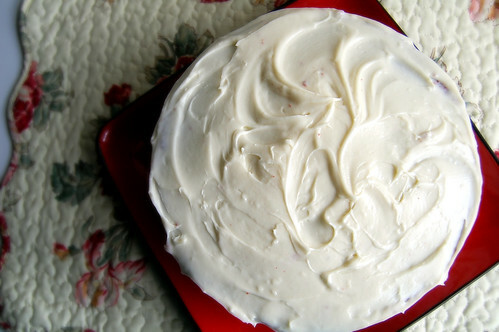 I have baked red velvet cake numerous times including the famous Magnolia Bakery in NYC. We live in NYC so I frequent the shop often... and I must say that hands down your recipe is the BEST I have ever baked, bought, or tasted. Thank you so much for this wonderful website. I am so happy that I came across it by accident. P.S. I also tried your blueberry cheesecake crumb recipe as well. WOW!!!! I absolutely adore it and I can't wait to try out some more! Thank you Thank you!! !